This Thanksgiving I am teaming up with Roger from Easy Recipes and Stuff and Michael from Caveman Food to put together a fantastic Thanksgiving feast. Thanksgiving supper has always been steeped with tradition in my family. We never stray far from the menu. It is the only holiday menu that never changes. Except for the addition of desserts to the usual line up. What are your Thanksgiving traditions? Is your menu the same from year to year or do you like to change it up? Welcome to our version of Thanksgiving 2013! I keep it fairly simple. The bed of vegetables add depth and make a nice flavorful gravy. The butter makes for a nicely browned skin yet keeps it tender. First I make a bed of carrots and onions for the turkey to rest on. I season it well with salt and pepper. I wash the bird with cold water. If I am not stuffing the bird I will salt and place a couple of whole onions in the cavity. I slather the entire bird with a coating of butter then season it with salt and pepper. Add some water to the pan then cover with a lid or foil that has been sprayed with non stick spray. 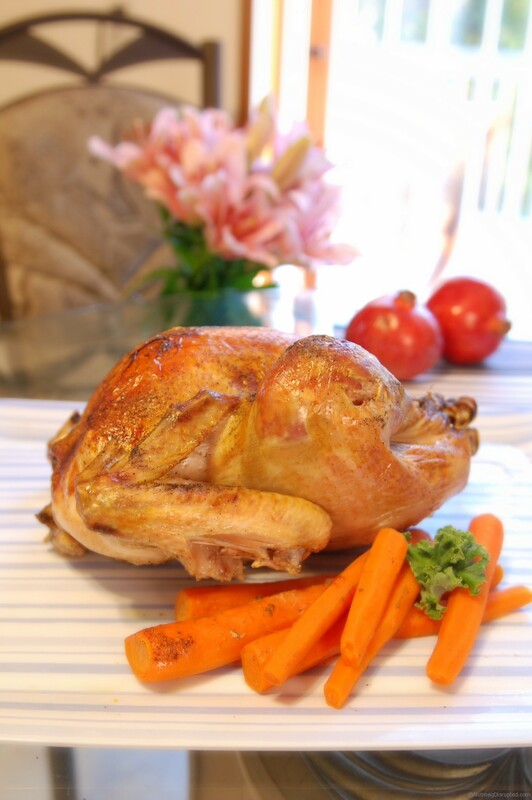 Roast in a 325°F oven for 20 minutes per pound until it reaches an internal temperature of 170°F in the breast and 180°F in the thigh. Let rest for 20 minutes. 1 and 1/2 lb. Brussels sprouts, trimmed and halved (I did not halve because I like them whole if you do also, add at least 5 minutes to cooking time). 2/3 cup pickled red onion (recipe below) – chopped. 2 oz. prosciutto – thinly chopped. Chipotle Honey Ailoi: 1 pod chipotle pepper minced, 1 Tbsp of adobe sauce (sauce in the chipotle can), 2 Tbsp mayonnaise, 1 tsp fresh lemon juice. Mix together in bowl. Pickled Red Onion: 1 red onion – sliced into thin rounds; 3/4 cup rice vinegar; 5 black peppercorns; 5 allspice berries; 3 springs of thyme; 1 clove of garlic – halved; 1 small dried red chili pepper; 1/2 tsp. sugar; 1/2 tsp. kosher salt (or sea salt). In a mason type jar place sugar, salt, vinegar, and spices (except thyme). Gently stir to mix. Add fresh thyme. Place sliced red onion in a colander resting in the sink. Bring 3 cups of water to a strong boil. Slowly pour the boiling water over the sliced onion to lightly blanch them. Drain water. Add the blanched red onion to the mason jar and stir gently. Place lid on jar and store in refrigerator for at least 30 minutes. I occasionally gently shook the jar to get all onion slices covered with the picking juice. Spray Canola Oil on 9.5 x 13 oven baking dish. Place Brussels sprout in pan, sprinkle with garlic and olive oil, mix together. Roast for 20 minutes cut side down (if Brussels sprouts were halved, if not halved add 5 minutes). In a fry pan heated to medium high cook the prosciutto. Remove Brussels sprout from oven, turn them over and then sprinkle with prosciutto. Return to oven for 25 minutes. With 10 minutes left on time add the the Chipotle Honey Aiole and pickled red onion and mix. Place baking dish back in oven for remainder of time. 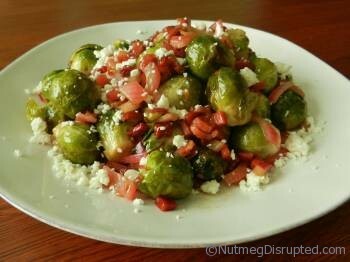 Plate the Brussels sprouts and top with crumbled cheese. Roger got this recipe from the November 1996 Gourmet Magazine. It has been a family hit every year since then. 6 cups torn bite size pieces of crusty bread. 1/2 stick unsalted butter (about 1/4 cup). 2 cups – low sodium chicken broth. 4 celery stalks – chopped. 1 Tbsp fresh rosemary – minced. On a baking sheet arrange bread pieces. Place on middle rack of oven and occasionally turn to golden brown both sides (approximately 20 minutes). In a large fry pan cook bacon on medium high. Remove bacon when crisp. Turn off heat, and to the bacon fat the butter. Return heat to low. Add the onion, celery, rosemary, stir. Add salt and pepper to taste. Cook until soft. 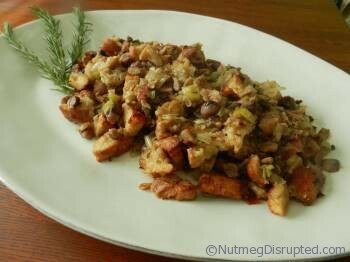 Add the chopped chestnuts and cook for an additional minute or two. To a large mixing bowl add bread, and then mix in chopped bacon. Next add the onion/chestnut mixture, and Italian parsley, and stir well. Butter a 4 quart baking dish. Place the ingredients in the baking dish. Slowly drizzle the chicken broth over the dressing. Cover with foil and place in oven for 60 minutes at 325 F. Next remove the foil and cook for an additional 30 minutes. 3 cloves garlic – peeled and halved. 1 and 1/2 cup half and half. In a large kettle place potatoes and garlic. Add water to cover by two inches. Bring to boil and then reduce to simmer for 20 to 25 minutes or until potatoes are tender. In pot on low heat slowly bring half and half to a simmer. Drain water into colander being careful to retain the garlic with the potatoes. To a large mixing bowl add potatoes and garlic. Stir half and half and butter into bowl of potatoes and mash. Add salt and pepper and continue mashing until you like the texture. Plate and add a little thyme garnish. Going the traditional route, it is not Thanksgiving unless you have pumpkin pie! 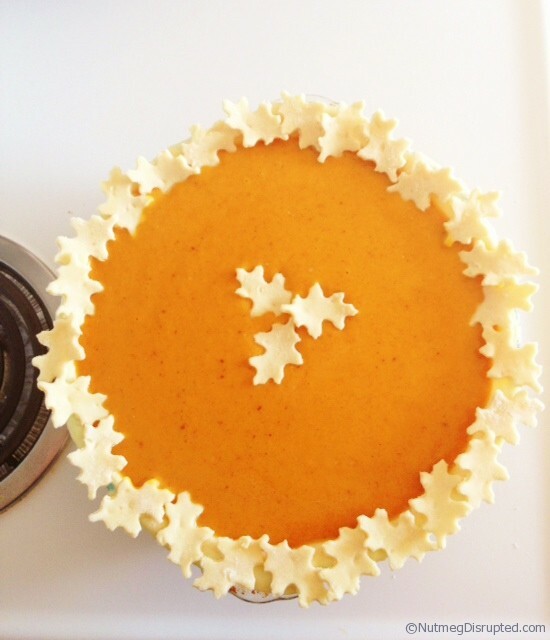 It is easy to give a simple pie a touch of class with embellishing the rim with some cut leaf cut outs. You can see step by step photos of the entire process here. Preheat the oven to 375 degrees. Bake whole washed pumpkins on a baking sheet for 40 – 45 minutes. Allow to cool. Cut pumpkins in half and remove seeds. Scoop out the pumpkin pulp, mash and set aside. Makes about 2 – 2 1/2 cups. Turn oven to 425 degrees. Place pumpkin mash into a food processor and puree until smooth. Add sugar, salt, cinnamon and nutmeg and evaporated milk. Blend well. Pour into a prepared pie crust. Bake for 15 minutes. Reduce heat to 350 degrees and bake for another 40 – 50 minutes or until a knife inserted into the center comes out clean. Let cool for two hours. Get your glass of water from the freezer. Combine flour and salt in a medium sized bowl. Cut in the shortening. Place the egg and vinegar in a 1/2 cup, top up with the water from the freezer. Stir this into the flour mixture. Stir until a ball is formed. Shape into 2 small discs and wrap, place in the fridge for 30 minutes. Roll the dough out on a floured surface large enough to line your pie plate. I used the scraps and an oak leaf cookie cutter to make leaves for the edge of the pie. For something a little different these tarts pack a punch of flavor and are show stoppers! Remove grapes from the stems and give them a good wash. Place them in a medium sized pot and add 3 tablespoons of lemon juice and place over medium low heat. Bring the grapes and lemon juice to a simmer over medium heat for 12 minutes or until all the grapes are popped. Strain the grapes in a fine mesh strainer until all the juice stops dripping. I did press the grapes to get every drop of juice I could. Place the juice and sugar back into the pot and place over medium heat. Bring to a low boil stirring occasionally until a temperature of 220 degrees is reached. Remove fro heat and allow to cool fully. The jelly will set once cooled. While the jelly is cooling make the tart shells. Cream the cheese and butter with a mixer. Add the flour and beat until a dough is formed. Place in the fridge to chill for about 20 minutes. Spray a mini tart pan with non stick spray. Press the dough ball into each cavity and form the shells. 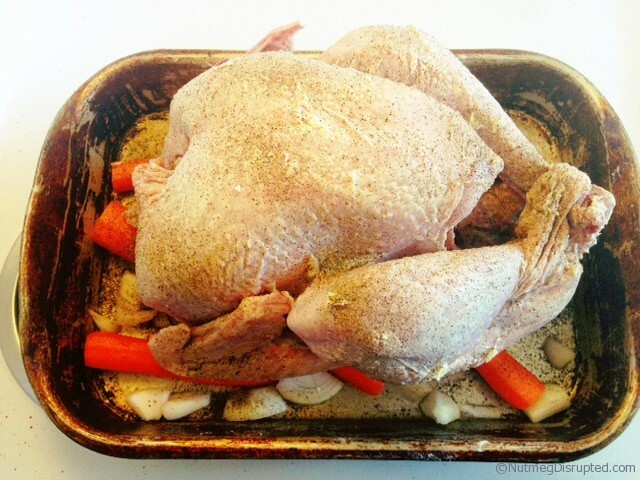 Bake in a 325 F degree oven for 20 – 25 minutes until lightly browned. While the tart shells are baking make the meringue. Whip the egg whites until foamy with a mixer. Once foamy slowly add the sugar whipping well. This should take about 8 minutes. Once the tart shells are done spoon a generous teaspoon of jelly into each shell. Using a pastry bag or a teaspoon place a dollop of meringue on to each tart. Broil for a few minutes until nicely browned. Nothing screams autumn like butternut squash. Because of its natural sweetness, it is often used in place of pumpkin for desserts. In addition, it makes for a delicious, creamy soup that’s perfect for the holiday table as an Entrée (in the French sense) to the meal. The secret to this recipe is its versatility. It’s the additions to the basic soup that make it special. In this particular recipe, I used crème fraîche, salt pork, and fried sage, but you could easily use sour cream, bacon, and thyme. Tailor it to the rest of your meal, if you wish. Cut the salt pork into small pieces. Place salt pork in a pot over medium-high heat and cook until the pieces are crispy and brown and most of the fat is rendered off. Strain away and reserve the fat. Dice onion. Place two tablespoons of the bacon fat back into the pot and sauté the onion pieces over medium heat until they are soft and golden brown. Meanwhile, peel the squash and scoop out the seeds. Cut into 1 inch cubes. Add squash and chicken stock to the onion and bring to a boil over medium-high heat. Once boiling, reduce heat to a simmer and cook until squash is completely soft (about 20 minutes). Process either with an immersion blender or in a stand blender in batches. Carefully blend until smooth. Add honey, spices, salt, and pepper. Stir to combine. Serve in bowls and top with pork pieces, garnish with a fried sage leaves, and drizzle with crème fraîche. 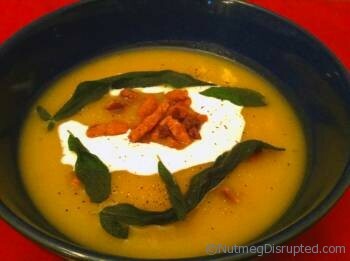 Note: The amount of honey you add is dependent on how naturally sweet your squash is and how sweet you want the soup. Use your own judgment and preferences. Next Post - Next post: Smoked Gouda with Seckel Pear. You holiday meals sound very similar to what we eat as well. Though occasionally I will deep fry the turkey for a change. I think it will remain the same for as long as I am cooking. I have always done a prime rib for New Years. Our holiday dinners, Thanksgiving-Christmas-Easter, are always the same. Turkey, ham, green salad, perogies (only cheddar), perishka, mushroom cream sauce, cabbage rolls (sweet), cranberry sauce, gravy, stuffing (bread with herbs, nothing fancy), jellied pig’s feet (for Baba. it’s like headcheese). Dessert is always Pumpkin Pie, Coconut Cream Pie, Lemon Meringue Pie and sometimes Apple Pie. There’ll be extra cookies and chocolates out for coffee and whatnot, but that’s the menu. The same dishes prepared by the same ppl (my mom and aunts) year after year. If I want to mix things up we do it at our small family dinner the day before the big holiday dinner at the farm.